If you were born in the late 1990’s or early 2000’s then the name Ben Tennyson should definitely ring a bell. Ben is the main character in one of Cartoon Network’s most popular franchise, the Ben 10. It has won a total of three Emmy Awards and raked in over $4.5 billion in retail sales worldwide. The story itself revolves around a young boy with a watch-like device that allows him to transform into 10 different alien creatures in order to fight the bad guys. 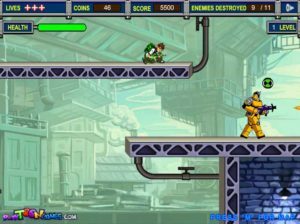 Aliens Kill-Zone is a classic 2D platformer where your mission is to infiltrate the enemy base and stop them from carrying out their evil plans. You’re equipped with an energy weapon that shoots out green bursts of energy and to my surprise it was actually very effective against the bad guys. Just a couple of shots were all that was really needed to take out an enemy wearing heavy looking body armor. In order to beat the level you have to kill all of the enemies present in that level, otherwise the door which lets you leave will simply stay shut. 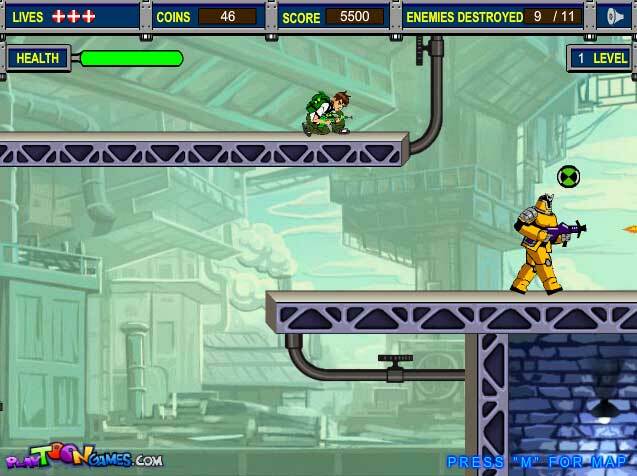 Fortunately you can open the level’s map by pressing the “M” key on your keyboard which will show you the layout of the level and the location of all of your enemies. It’s a cool game, but I was a little disappointed by the enemies A.I system. I mean come on, they don’t even turn around when you’re right behind them and simply continue walking their predetermined paths. 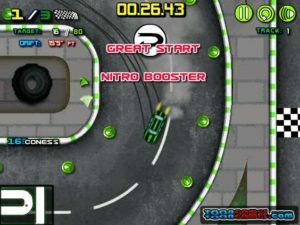 Ben 10’s Car Drifting is, as the name suggests, a racing game with an emphasis on drifting because you are required to use your drifting skills in order to complete the levels. It’s a top-down oriented car game sort of like GTA 1 and 2. Bonus points to you if you played those games as you were growing up! While Ben 10’s Car Drifting might look really simple and easy, you’ll realize soon enough that looks can be quite deceiving. I was having some serious trouble completing even the first race successfully because you have to 1) hit at least 80 cones, 2) drift for at least 50 meters and 3) your race time has to be under 1 and a half minutes. All of those requirements combined make this game difficult even for experienced players. Overall I love it how the game, which seemed so easy at first, turned out to be one of today’s greatest challenges for me. I just spent an hour and a half playing the game without even realizing it and my tongue is still sore from rubbing it against my teeth (I do this when things get too intense). On top of everything there are a ton of additional vehicles and racing tracks to unlock, only if you’re good enough. A coloring game, really? Yep! Not a lot of action in this one, but believe me when I say it’s worth checking out. It’s almost like a psychedelic experience. If the weird looking alien creatures that you get to paint in cute neon colors isn’t enough then just listen to the music. It’s only a few seconds of some pretty strange stuff, but it’s set on a infinite loop and that’s what makes it so wonderful. Just be careful not to lose your mind completely.